Around the Rink: Manchester Storm Art! Tickets for Storm’s upcoming game against Cardiff Devils can be ordered online HERE, or by calling the box office on 0161 926 8782, or in person at the box office. You probably see amazing hockey themed artwork from time to time doing the rounds on social media. 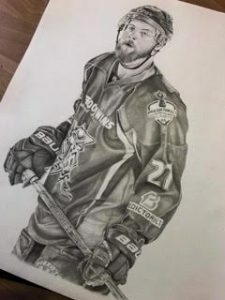 It turns out there’s a few talented Manchester Storm fans around the Storm Shelter and we wanted a chance to share it. This week we spoke to Storm fan, Emily Ritson and asked her a few questions about her art. We hope you appreciate it as much as we do! Hi Emily, please tell us a little bit about yourself! I’m self taught. I try and learn something new from each drawing. I used to draw pictures for my friends at school and charged them 50p but now I mainly draw for fun and in my spare time. What has been your favourite Manchester Storm drawing to date? Emily: My favourite drawing was the latest one of Matt Ginn. It was a real challenge with all the detail in the kit, but that’s what I enjoy. Which player was the hardest one to draw? 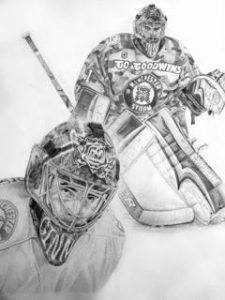 Emily: The hockey drawings are all pretty hard because of the minor detail needed. You have all the sponsors and badges, and then the kit. The lettering is always the trickiest part. The Ginn drawing was the most detailed i’ve done so far, but I like challenges, so it was fun! Which player do you plan to draw next? Emily: I always look through the photos after games and see what I can I find. I always think of which ones would translate well into a drawing. There was one of Felix Poulin which I thought would look pretty cool so that’s what i’m working on now. I’d really like to start adding more colour to my work. I’m just hoping that i’m on Santa’s nice list so that he will bring me some nice crayons. Tuesday 27th November is the inaugural Manchester Storm and Salford University Student Night event at Tiger Tiger Manchester! It’s the perfect opportunity to socialise with friends and meet the players. Drink offers available, find more information HERE!